Show splits in the graph. Whenever the driver crossed a split point, you now see a vertical line in the graph. Colors with higher contrast. We thought it’s prettier with the old colors, but some people couldn’t see the graph very well with a lot of glare, and sometimes it’s more important to be useful than beautiful. Zooming in the Y direction. Use the mouse wheel on the Y axis to enable this. This is what the new graph looks like. Most of the changes are in how it interacts, but you can already see the split lines and the new X axis. On-power mode in the histogram. We promised this a while ago, so I’m very happy we finally have it. Using this mode, you can configure the histogram to only count the times the driver was accelerating. This is important especially for RPM, which can be all over the place when braking. Re-organize export options, and give the option of “interpolated data”. With this option, you can simply export all your channels at, for example, 10Hz. This makes it much easier to use the data in Excel or Matlab. Stop auto-opening so many runs after import. Now, it will only open up to three runs. If you imported more than that, nothing will be shown automatically. If you’re wondering why we’re calling this one “Lumberjack Edition”, it’s because at some point in development, a bug made the histogram look like a plaid shirt. Lately, we’ve been getting some questions about how to actually take advantage of data logging and analysis, and so I thought I’d write a short guide on how to get started. 90% of data analysis comes down to comparison. 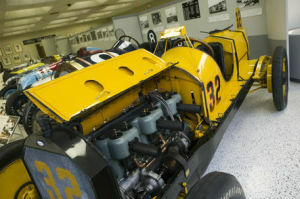 An experienced driver can, for example, compare two different lines through a turn by driving that turn one way for three laps, and then another way for three laps, and then comparing the data to see which one works better. However, the basis for this process is being consistent. The driver has to be able to do the same thing three times in a row, on purpose, to build up that comparison. In this tutorial, we’ll work on finding that consistency. 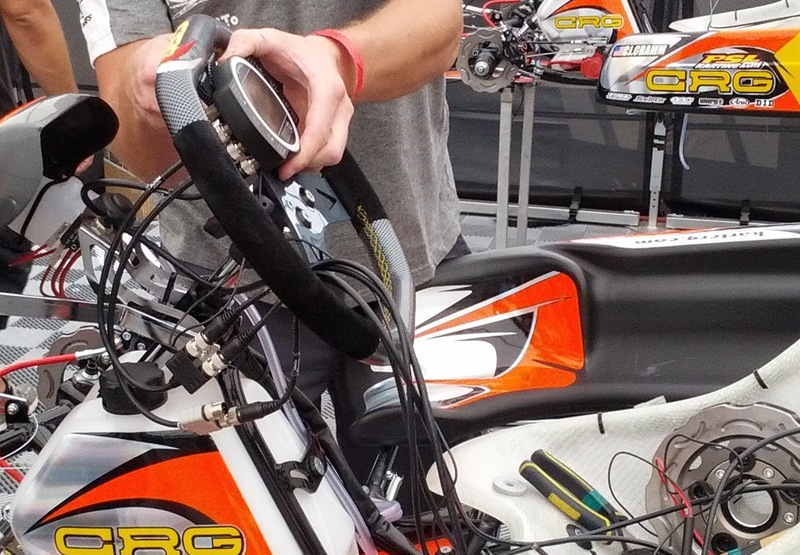 All you need is a lap timer with a speed sensor, and working lap times. Split times are nice, but not necessary. As for the software, the steps will work with any analysis software, but naturally all the examples will use Off Camber Data. First, we’ll have to get some data. Put in a good session with some nice, clean laps. Try to minimize distractions like changing conditions, technical problems, going off the track, or (hardest of all), traffic. Try to drive at 9/10th, relax, step away from the ragged edge. You’re not trying to break the lap record just yet. You want to get some good data. Show and hide laps by right-clicking on them and selecting the right item from the menu. In case you can’t go out to the track right this second, we’ve made some data available for download for you to experiment on, so you can follow along as we go. Simply download the file and import it into OCD. The file contains real data from an event in Kristianstad in Sweden. After importing the data, either from your lap timer or from our example run, the first thing we do is make sure only the laps we care about are enabled. By default, Off Camber Data will “hide” the out lap, the in lap, and laps that are too slow, but it is not very aggressive about it. The sample run happens to be from a race, so it has three laps at the beginning that are not real times (an out lap, a formation lap, and the first two laps with a slow start and a lot of traffic). Also, at the end there are two slow laps. To disable them, right-click on the laps and select “Hide Lap” from the menu. You can also select all of them at once and click “Hide Laps”. 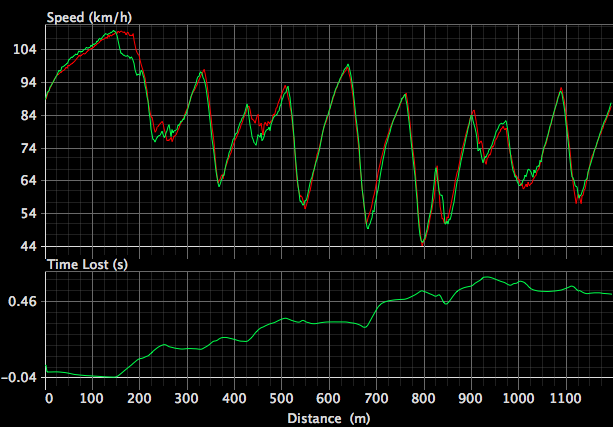 Hidden laps are still there, can still be graphed, and can easily be un-hidden (shown) again, but they don’t participate in calculations for the theoretical best lap or the rolling best lap, and they are never auto-selected. Now, let’s take a quick look at the split times view. If you don’t have split times on your track, you can skip this step. The split times table for Matt’s run. The most important row is the “Range” row. It shows us the gap between the best and the worst we did in any particular sector. It shows us where we were the least consistent, and where we have the most to gain. In this case, we see that the range of times in sector one is 3/10ths, in sector two almost 8/10ths, and in sector three it’s about 2/10ths. Those are big ranges! If you remember some particular reason why you were extra slow in one of those laps, you can go through them here and hide those laps as well. In this case, we disable lap 4 and lap 8, because something happened in the second sector in those laps. Without those laps, the ranges are slightly more reasonable, with the first sector having the largest amount of inconsistencies. If, at this point, you find that your times are very consistent, and the ranges are very small (under 2/10ths or so), you took my advice above a little too seriously. Go out again and driver a bit faster! Brake later, try to carrying more speed through the corners. 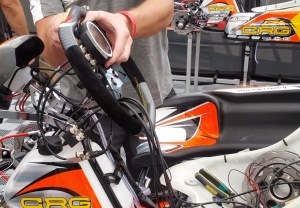 The goal is to have a really good lap, a good sector, maybe just a good sequence of turns, and then use the data to find out exactly why that lap, sector, or turn was so good. If your times are all over the place, and you can’t see any consistency at all in the times, go out again and drive a bit slower. 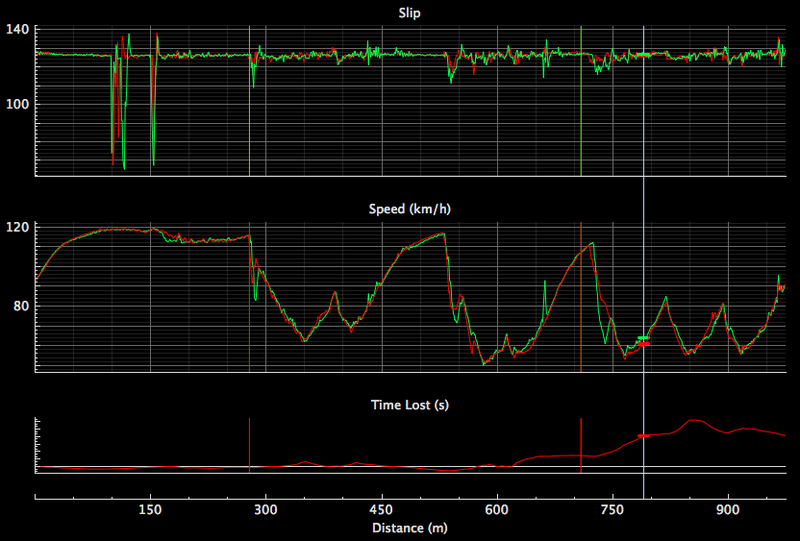 You can see that a lot of the time, the speeds are very consistent from lap to lap, but in some places, they vary a lot. There is a bit of inconsistency after the 900m mark, some more at 450m, but the graph is the messiest in turn 1 and 2, between 50m and 300m. This is where we’ll try to figure out some improvement! Since the example file has split times, we can look at the split times to find which lap is likely to have the best turns 1 and 2 in it. In this case, that’s lap 12. If you don’t have split times, the best overall lap is still a good first guess. However, there is no guarantee that the fastest way through these turns happened in the fastest lap. Let’s look at the laps pairwise, to see which one is truly fastest in the area we’re interested in. To do this, first select the lap you suspect was best, and then select one other lap in addition to it. 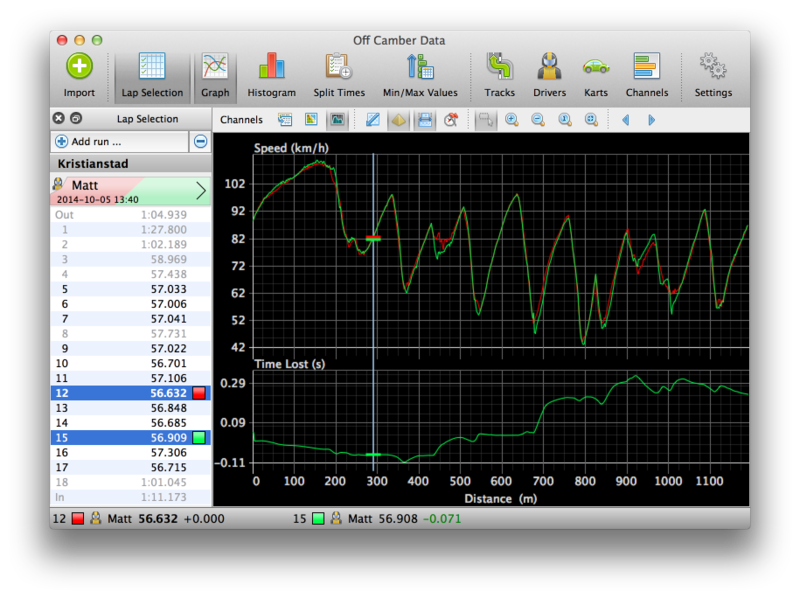 In Off Camber Data, you do this by holding Ctrl, and clicking on the other lap. When two laps are selected, it will show you the Time Lost graph (also called the Delta Graph). The delta graph for laps 12 and 15. After around 300m, the green lap is 0.071s behind the red lap. This graph always compares the slower of the two laps with the faster of the two laps. 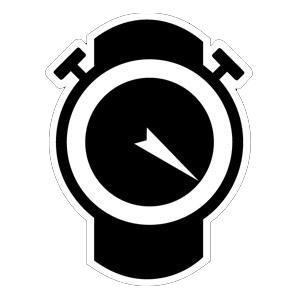 When this graph goes up, it means the slower lap lost time. When it goes down, ￼it means the slower lap gained time compared to the faster lap. In our example, the graph goes down between 50m and 300m when we compare lap 12 and lap 15, so lap 15 was actually faster than lap 12 here. However, the difference is pretty small. 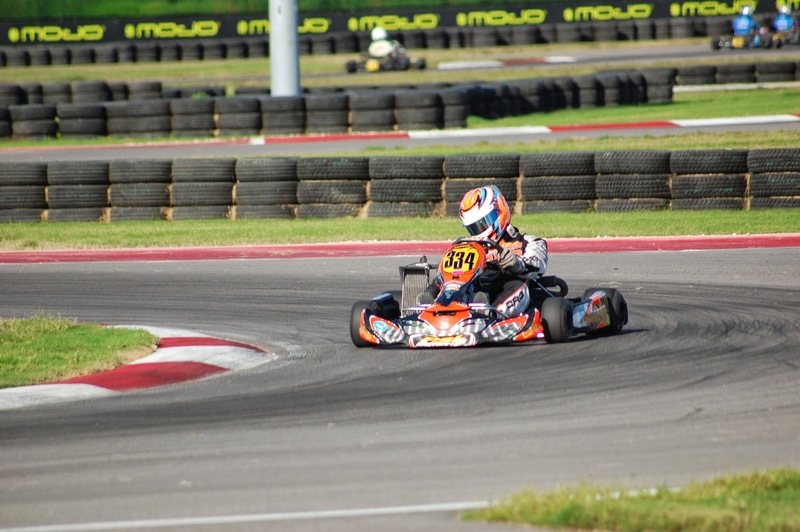 Now that you know which way through the messy part is the fastest, you can start comparing to the slower laps, and see what kinds of errors you made. In our example, let’s compare laps 11 and 12. This graph is very interesting! It looks like Matt was actually a little faster into turn 1 at first. 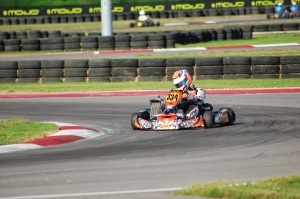 However, turn 1 is a long, fast right-hander, and he might have lost his nerve a bit and got on the brakes too early. Immediately, the delta graph jumps up, and he loses over 1/10th of a second. 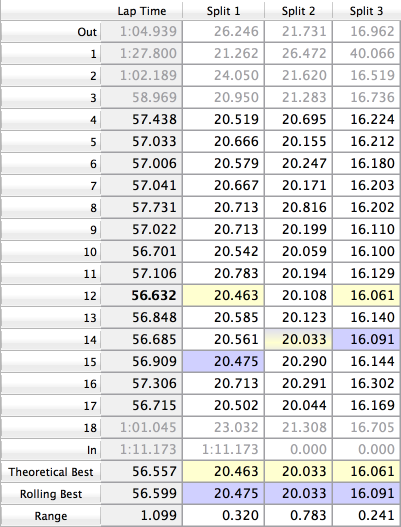 Do this kind of comparison between the fastest lap (in the section you’re interested in) and more of the slower laps. You will probably see a pattern, a repeated mistake. The two most common differences are braking too early (like in our example), and braking too much, i.e., not carrying enough speed through the apex of the turn (in our example at 450m). Now that you know what goes wrong, go out again and drive. 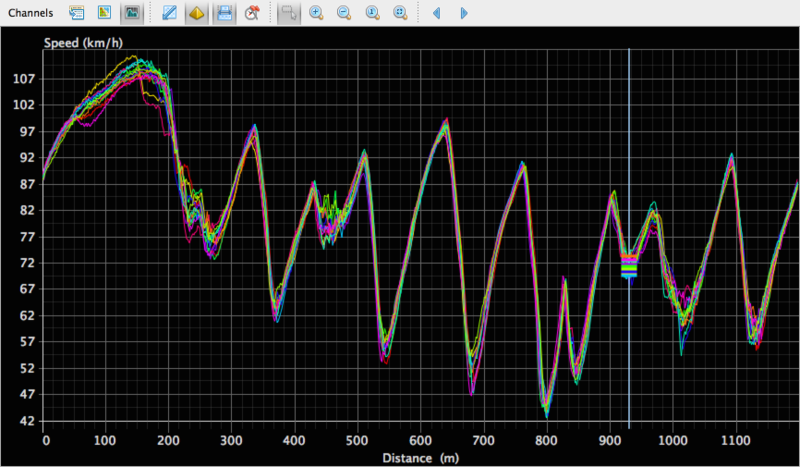 When you get to the part of the track you were looking at earlier, try to remember what you saw on the data. Matt will remember that he was braking too early into turn 1, and try to go just a little bit longer before taking his foot off the loud pedal. If you have a good memory, you can try to work on several parts of the track at once. Remember, the main goal is to be able to drive the same lap time again and again. You have to be consistent before you can be fast. You might find that one time you got a sequence of turns just right, and you just can’t figure out how to do that again, despite all the data in the world. In that case, try to settle on a slightly slower variant, understand what you did to drive that way, and learn to drive it that way every time. Then, when it’s time to do experiments, you already know where to start 🙂 . This is our first tutorial. Please let us know your questions and suggestions, so we can improve not only the software, but also the material here on the website. You can either leave a comment below, or email us at feedback@offcamberdata.com. Cheers!